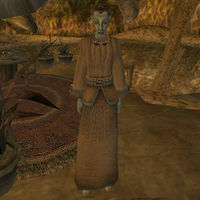 Ferise Varo is a Dunmer mage who operates Varo Tradehouse (along with her husband Burcanius) in the town of Vos. There she sells spells and spellmaking services to all who need them. Ferise is notable in that she is the only spell merchant in the game who sells spells in all six schools of magic. She wears a common robe and a pair of expensive shoes. She carries a silver dagger. Aside from her natural resistance to fire and the sanctuary provided by her ancestors, she knows a selection of spells from all six schools of magic. Specifically, these are the same spells she has for sale.